Beginning November 13: M-Th: Noon-9pm; F: Noon-11pm; Sa: 11am-11pm; Su: 11am-8pm. Rothman Institute Ice Rink (Opens November 13), M-Th: Noon-9pm; F: Noon-11pm; Sa: 11am-11pm; Su: 11am-8pm. See the website for specific holiday hours. Rothman Cabin (Opens November 13), See the website for hours. Made In Philadelphia Holiday Market (Opens November 21), Su-Th: 11am-7pm; F-Sa: 11am-8pm. See the website for specific holiday hours. Close to 50,000 skaters enjoyed the inaugural season of the Rothman Institute Ice Rink at Dilworth Park. This year, the Rothman Institute Ice Rink will offer expanded hours, special events, promotions and the opportunity to learn to ice skate! Open daily through February 28, 2016, admission is $3 for children ages 10 and under and $5 for adults. Skate rental is $9. New this season is the heated Rothman Cabin on the north end of the ice rink. Just steps away, enjoy tasty food and drink from Garces Events, featuring everything from Cuban burgers and fries to hot chocolate and coffee to get you warm and ready and back out on the ice. It's going to be another great season of skating and fun, right in the heart of Center City! 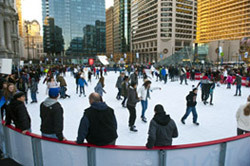 Visit DilworthPark.org/rothmanicerink for special holiday hours, events, rental information, and more. This Holiday season, visit the Made in Philadelphia Holiday Market at Dilworth Park, showcasing local artists, crafters, confectionaries and designers. The market will be open from November 21 through December 27. For vendors and the complete schedule, visit DilworthPark.org/madeinphiladelphia. All aboard! Santa Claus is coming to the Rothman Institute Ice Rink at Dilworth Park on SEPTA! Board specially decorated SEPTA trains filled with entertainment for a fun-filled holiday ride to Dilworth Park. 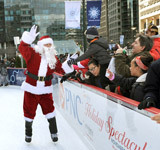 A festive parade will welcome Santa Claus, Mrs. Claus and the elves to the Rothman Institute Ice Rink at Dilworth Park. Then, plan to stay and skate with our ice-skating Santa. Visit SEPTA.org for train times and locations. The rink will be open 11am-11pm. This holiday season, have Brunch with Santa at the Logan Square Café in Sister Cities Park! There'll be seatings at 9am and 11am each day, with additional seatings available upon request. Plus, the brunch includes giveaways and a free carriage ride around Logan Circle! Reservation and pre-payment required. The menu includes: scrambled eggs; bacon and sausage; tater tots; French toast sticks; an assortment of muffins, bagels and danishes; coffee, tea, fresh orange juice and juice boxes. $12.95 for children (12 and under), $17.95 for adults, 2 and under free. Group rates available. Please call 215.665.8600, email info@logansquarecafe.com, or stop by the café to make your reservations today.